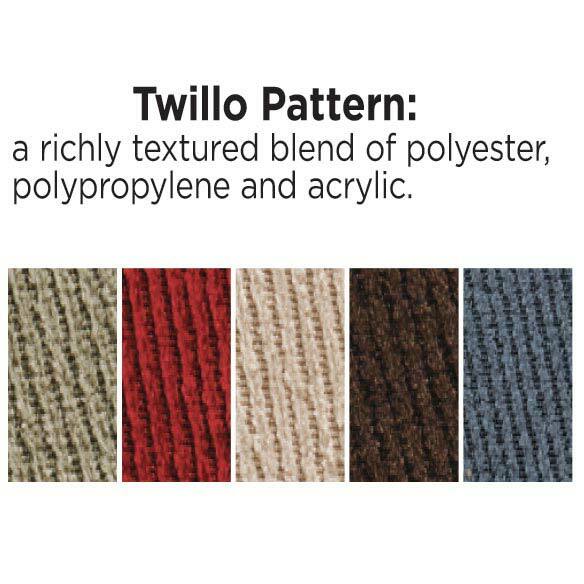 Twillo rocking chair cushion features thick padding and deep tufting. This rocking chair cushion makes our rocker set extra comfy in a richly textured blend of polyester, polypropylene and acrylic. 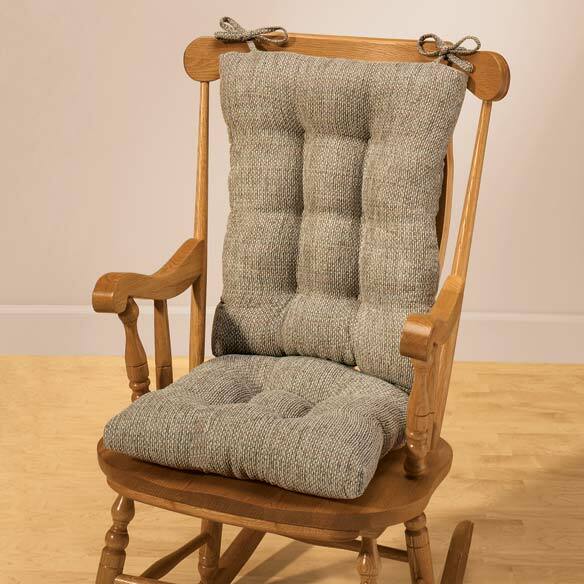 The back cushion (22 1/2"L x 18 1/2"W x 4"D) fastens to the rocker with 4 matching ties and the seat cushion (18"L x 17"W x 3"D) rocking chair features a coordinating slip-resistant “Gripper”® latex/polyester backing that secures it on the rocker seat. Stain-resistant, spot-clean cushions are filled with polyester fiberfill. USA. Buyer beware - measurements are not true. 16" X 20" (not 18 1/2" x 22 1/2") and the bottom cushion only measured 16" x 16" (not 18" x 17"). Needless to say, they are (and look) too small for my chair. I was told I could return them for a refund, but it would cost me $7 in postage to do so. What an inconvenience!!! The cushions fit perfectly in my favorite rocker. Color enhances color scheme in room. Cushions are so comfortable! shopped around for quite a while couldn't find in the local stores. Was a little apprehensive about ordering on line but it is a perfect for and just in time for the holidays. Sturdy looking and thick cushions. Nice cushion and looks good. Finally after several years of looking I found the color and comfort I wanted for the rocking chair my mother gave me years ago. The Rocker Cushion Set is great. The problem is I am getting real tired of getting emails from Miles Kimball. I use my email for work and every time I get a email I have to check it. And if I am busy or driving and I get junk email it makes me very unhappy. I was so happy to FINALLY find rocking chair pads that look great, stay in place and are comfortable! I am satisfied with the quality and color description. I ordered blue and it is a soft powder blue. Good value for the price. The non-skid backing on the bottom cushion works well with my wooden rocker. Have tried other cushions that have not worked well. I purchased this cushion set because of the measurements stated. I have a large cricket rocker. The quality was lovely, but the seat size was smaller than described. The buttons on seat cushion were so hard it felt like sitting on stones. It looks very comfortable! And it's the closest size to the chair I bought! Looks well made! Perfect for a new rocking chair purchased. Good quality company. Our cats ruined our original ones! The cushion looked like quality material. Colors were good. I need cushions for a wooden rocker I recently bought. Size I needed and looks great for the price. I tried finding cushion set in retail store and couldn't find any to fit my rocker. I hope this fits my chair. what color is that in the pic.? BEST ANSWER: Thank you for your question. The color shown in the picture is sage. We hope this information will be of help to you.